The CAN-BIND program is continuing to follow-up with participants from the CAN-BIND 1 to help them maintain their wellness through additional research studies. These follow-up studies will help researchers understand why some individuals remain well after treatment with antidepressant medication, while others experience a return of symptoms, or a “depression relapse”, and to identify predictors of relapse. This will ultimately help people with depression get well and stay well. Participants will benefit by having the opportunity to work with a study team to track their mood symptoms, physical activity, and sleep. Other upcoming CAN-BIND studies are investigating new therapeutic options for depression. One tool, Rhythmic Sensory Stimulation involves using both sounds and music to induce changes in patterns of brain activity, in the hopes of relieving symptoms of depression. There is compelling evidence about the role of music in improving wellness. Understanding its role in depression could provide patients with a non-invasive way to manage depressive symptoms and maintain wellness. Another tool being investigated is repetitive transcranial magnetic stimulation (rTMS). This is a non-invasive brain stimulation technique that involves stimulating specific areas of the brain with magnetic field pulses. By collecting magnetic resonance imaging (MRI), electroencepholography (EEG), health-related questionnaires and the collection of blood samples for all participants, researchers hope to identify biomarkers of response to rTMS treatment. Understanding who responds to this treatment will enable rapid and accurate treatment selection, allowing patients to get better faster. Dr. Shane McInerney organized a day of appreciation and celebration for CAN-BIND-1 participants and their family and friends, as well as representatives from CAN-BIND, the Ontario Brain Institute (OBI) and the Mood Disorders Association of Ontario (MDAO). 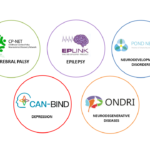 The event, which took place in downtown Toronto and was hosted by both CAN-BIND and the OBI, offered participants an opportunity to share experiences related to depression and participating in the CAN-BIND-1 research project. Participants also had the opportunity to learn about community resources and future CAN-BIND initiatives. Notably, the day featured a lived-experience speaker, who gave a courageous, genuine and inspiring account of participating in CAN-BIND-1, and her journey in overcoming depression with the support of family and friends. To build on the success of this event, similar events are planned for the future. EpLink researchers are planning a study with Synaptive Medical to improve surgery outcomes for the treatment of seizures, while minimizing the risk of damage to vision. Using magnetic resonance imaging (MRI) to map the neuronal pathways in the brain will allow surgeons to better avoid neuronal pathways for vision. The goal is that this will minimize problems with vision after surgery and increase the likelihood of patients regaining their driver’s licence. Researchers are also recruiting for a clinical study that will use the EEG electrodes already implanted within the brains of people with epilepsy. These electrodes will be coupled with a new computer model that will sense precisely when a seizure is starting and a new mathematical approach to determine where the seizure is starting. This will allow for more targeted brain stimulation to stop seizures. In partnership with Epilepsy Support Centre, EpLink recently hosted two events. The first was an information session on medical marijuana for the treatment of epilepsy in London, Ontario which drew a crowd of over 50 people. The evening featured talks from EpLink researchers, parent and patient advocates, as well as neurologists from Western University. Talks were followed by an open forum discussion on the use of the medical marijuana extract, cannabidiol, for seizure management. The second was a fundraiser (‘Dueling Pianos 4 Epilepsy’) held in London, Ontario. Guests enjoyed musical entertainment by two pianists playing hits from the 90’s as well as raffles that took place throughout the evening. EpLink also hosted its first open forum on mortality in epilepsy with EpLink researchers, clinicians and members of Epilepsy Toronto. The presentations introduced the topic of mortality and educated attendees on current research and statistics to inform clinical practice. The forum increased awareness and initiated discussions about mortality in epilepsy and was attended by over 40 researchers, clinicians, non-profit and industry partners. OBI and the EPLink team would like to congratulate Dr. Roman Genov, Dr. Taufik Valiante and Dr. Jose Luis Perez Velazquez on being awarded a Collaborative Health Research Project (CHRP) grant from the Canadian Institute of Health Research, in partnership with NSERC, for their proposed work on sensing chemical changes in the brain that occur before seizures and the neuromodulation techniques needed to stop them. There have been exciting developments in the SoloWalk Initiative at the Ottawa Children’s Treatment Centre (OCTC) in adapting the GaitEnable device for youth with CP. CP-NET’s Dr. Anna McCormick and Ottawa-Based GaitTronics have successfully used the device so that four children could stand unassisted for the first time in several years. The families and participants really appreciated the experience and are looking forward to be part of ongoing research. This research won the CHEO Resident research competition, and is planned to be showcased at future international conferences. The researchers and entrepreneurs will also be showcased on OCTC’s annual telethon. CP-NET is exploring ways to maintain the momentum of this exciting partnership in the future. CP-NET recently held its annual workshop which brought together CP-NET researchers, coordinators, trainees, and stakeholders to hear about CP-NET research updates and begin to plan for the future of CP-NET. This year, CP-NET had a Technology Showcase where the Virtual Reality, Exergames, Solowalk, and orofacial access communication technologies were available to demo. 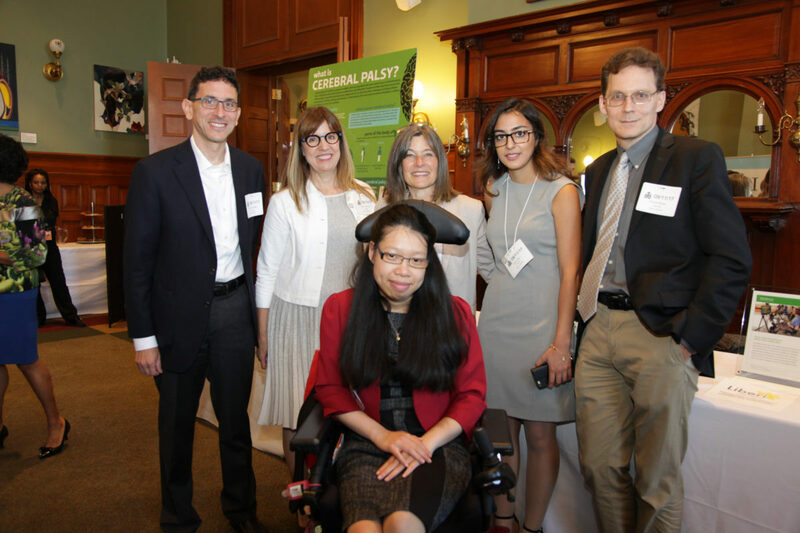 Individuals from the Toronto District School Board and investors from AngelONE were in attendance to view the showcase of technologies geared towards individuals with CP. CP-NET is also excited about its upcoming Exergames will be part of a two-week SPORTFit camp for children aged 7-14 with CP at Holland Bloorview Kids Rehabilitation Hospital from July 4-15, 2016. This is the second summer for the camp and provides intensive gross motor skill development, opportunities for cardiovascular exercise, and knowledge sharing around participation in community sports and leisure activities. In celebration of World Cerebral Palsy Day (World CP Day), we are hosting the 3rd Annual Creating Possibilities for CP: CP-NET Science & Family Day on Wednesday October 5, 2016. Please visit www.cp-net.org for more details about the celebration! 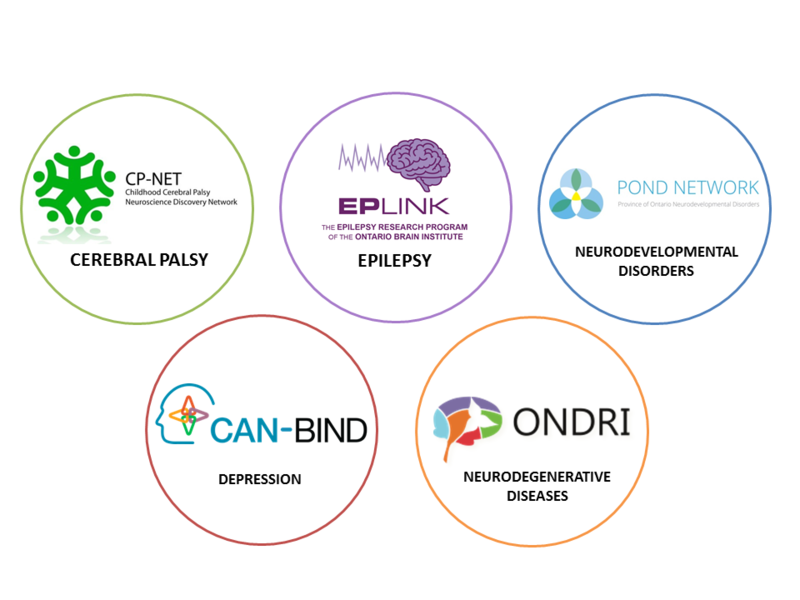 OBI and the CP-NET team would like to congratulate the many CP-NET researchers who were awarded over $12M in funding for the Canadian Institutes of Health Research from the CHILD-BRIGHT SPOR Network for Chronic Diseases. OBI and CP-NET would also like to congratulate Dr. Darcy Fehlings and Dr. Richard Wintle in being awarded the McLaughlin Centre Accelerator Grant. POND is excited to announce the establishment of an Eastern Ontario site at Queen’s University under the leadership of Dr. Xudong Liu. This research site will enrol kids with a diagnosis of autism spectrum disorder (ASD), intellectual disability (ID) or attention deficit hyperactivity disorder (ADHD), as well as kids who are typically developing. Phenotyping, genetic testing and imaging will be done at this site. This year, POND Family Day brought in over 400 attendees from across Ontario. Families took part in the day by submitting “burning questions” with their registration that were then addressed as part of the research updates or directly by POND experts throughout the day. Families were updated on all facets of POND research from genetics to translational models to imaging and finally clinical care. POND’s Patient Advisory Committee also led a powerful session on the importance of our research and how it has impacted their families. Finally, community partners and agencies were able to showcase their work and share about the resources they provide at this event. OBI and the POND team would like to congratulate Dr. Stelios Georgiades and Dr. Terry Bennett on receiving Hamilton Health Sciences Early Career Awards for their outstanding scientific contributions. OBI and the POND team would also like to congratulate Dr. Jason Lerch on being awarded new grants from the Simon Foundation Autism Research Initiative, Canadian Institutes of Health Research, and Brain Canada – The Azrieli Neurodevelopmental Research Program. A new research collaboration involving ONDRI and Sunnybrook Health Sciences’ Brain-Eye Amyloid Memory (BEAM) study will soon begin. The BEAM study is looking at three new non-invasive techniques that involve taking measurements to of the eye to detect dementia at its earliest phase. This is exciting since the BEAM study is the first study to leverage ONDRI infrastructure and capacity allowing the studies to share costs, patients, and data. The BEAM study data will also be stored in OBI’s Brain-CODE which maximizes the value of OBI’s investment in neurodegeneration research capacity and gives ONDRI access to data from over 200 more patients. In the media, ONDRI’s Dr. Carmela Tartaglia was featured on Global News talking about Alzheimer’s Awareness Month. Maclean’s Magazine featured an article about ONDRI and Dr. Chris Hudson discussing his experience having Parkinson’s disease and research about the eyes. The Globe and Mail also published a feature on this work. Dr. Robert Bartha and Dr. Manuel Montero-Odasso talked about their imaging and gait and balance research in a Toronto Star article. ONDRI researchers, Drs. Angela Troyer and Barrie Greenberg, also participated in a panel discussion hosted by Hot Docs and OBI. The panel discussed the science of memory after the screening of In Search of Memory, a documentary by Nobel Prize winner, Eric Kandel. OBI and the ONDRI team would like to congratulate Dr. Sandra Black, ONDRI Alzheimer’s Disease and Mild Cognitive Impairment Co-lead for receiving the Dean’s Alumni Lifetime Achievement Award from University of Toronto. Read more about members of the ONDRI team and their accomplishments including Shalane Basque and the neuropsychology team, Dr. Stephen Pasternak, Dr. Jennifer Mandzia’s, Dr. Morris Freedman, and Dr. Dallas Seitz. Watch ONDRI’s new videos about each of the assessments participants experience on their YouTube channel.